Because of sinus problems caused by a deviated septum, for many years, I have had major sinus problems and quite a number of sinus infections that had to be treated over and over again with antibiotics. As a result, I lost all my sense of smell. The house could be on fire and I wouldn’t know it unless I saw the smoke. Not Good! Six years ago, I was diagnosed with Rheumatoid Arthritis. I was suffering with chronic inflammation and severe pain in all my joints. Very interesting read Bill and Teddy and I can relate to the frequent trips during the night !! I feel like a zombie every day. they need something like this in the UK. Thanks for sharing. Hi Bill and Teddy, these water additives sound like great products. Much success! 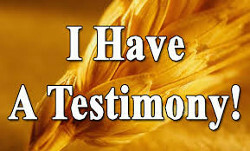 Great news and thanks for sharing your testimony. Shared your post so more people can read it. Wishing you continued blessings and have a great day.